Campeggio Le Val de l'Arre si trova a Le Vigan, Gard, è situato fiume/torrente. Questo campeggio dispone di piazzole delimitate, sia ombreggiate che e piazzole poco ombreggiate. È possibile affittare casemobili e appartamenti. Il campeggio dispone di un parco giochi e di un campo sportivo. Per gli sportivi, il campeggio prevede diversi percorsi in bicicletta. Ci sono un programma di animazione. Il campeggio dispone di una piscina scoperta e una vasca per i più piccoli. Nelle immediate vicinanze potete fare il bagno nel fiume/torrente. Non è sempre necessario cucinare, perché all’interno del campeggio ci sono snackbar e ristorante con menù poche portate presente. In campeggio è possibile acquistare pane fresco. Potete navigare su Internet, poiché nell'80% del campeggio potete navigare con il vostro portatile. Prenotazione facile e pagamento sicuro! The Roudoulouse Gite is quietly situated behind the campsite, it has a separate entrance, a garage, terrace and garden with garden furniture and a barbecue. You can enjoy all the facilities of the campsite. The gite is tastefully decorated and comfortable. Cellar with washing machine, dryer and storage. Fully equipped kitchen with oven, microwave, 4 burner stove, coffee maker, kettle and dishwasher, as well as all crockery. Comfortable lounge with two sofas, coffee table and TV with Freeview and DVD player. There is a bathroom with toilet, a shower room with toilet and 3 bedrooms. One with 1 160x200m bed, one with 1 90x200m bed and 1 140x200m bed, and a room with one 90x200m bed and a sofa bed. For weekly rentals, linens are provided (sheets, blankets, pillows, bath towels and tea towels). The Super Titania is the promise of a comfortable space with its 3 compact rooms, its large corner seat and functional kitchen. The many storage spaces available are a great asset for this model. Mobile home equipped with air conditioning. - Comfort of the big bench in L installed in the corner stay-living room with table and 3 chairs. - Kitchen with 4 burner gas hob, stainless steel sink with blender, fridge / freezer, classic coffee maker, kettle and crockery set. - Bathroom with a shower cubicle, sink and storage. WC separated from the bathroom. - 1 parent bedroom 1 bed 140x190 cm, a bedside, a wardrobe closet / shelves and a shelf. - 2 children's room 2 beds of 80x190 cm, a bedside table, a wardrobe and a shelf. - Fully covered terrace with garden furniture (1 table and 6 chairs) and a drying rack. 2 chairs chilliènne. Covers, pillows and household kit (without product) provided. Pitches delimited by trees of 80m ² with 120m ². Shady, sunny or half shade mid sun. Pitches delimited by trees from 80m² to 120m². Shady, sunny or half shade. Funny accommodation between the tent and the mobile home. 6.70 x 2.5m / 16m² 1 bedroom with double bed 160x200cm, bedside and storage 3 shelves with wardrobe. 1 bedroom with 2 benches convertible into 2 single beds 80x190cm, 2 storage bins on wheels. Between the 2 bedrooms living space equipped with fridge, microwave, table with 4 stools. Equipped kit of crockery. Covered terrace with equipped with 2 gas fire. Garden furniture, parasol, sunbath. Blanket and pillows provided. Provide bed linen and towels. The integrated terrace of the Loggia 2 model makes it an ideal 2 in 1 model: 9 m² fully covered to take advantage of its environment, whatever the weather! Mobile home equipped with air conditioning. - Dining area / living room with bench and a rectangular table with 2 chairs and a large bay window to enjoy the light of day whatever the time and the season. - Kitchen with gas hob 4 burners, stainless steel sink with mixer, fridge / freezer, microwave, coffee maker, kettle and crockery. - Bathroom with a shower cubicle, sink and storage. WC separated from the bathroom. - 1 parents bedroom 1 bed 160x200 cm, a bedside, a wardrobe closet and a large shelf, location for cot. - 1 children's room 2 beds of 80x190 cm, a bedside table, a wardrobe and a big shelf. - Exterior Garden furniture (1 table and 4 chairs) and drying rack. 2 chilean armchairs Covers, pillows and household kit (without product) provided. Dining area/living room with a bench and a rectangular table with 2 chairs. Kitchen with 4 gas burner hob, stainless steel sink with mixer, refrigerator and crockery. Bathroom with a shower, sink and storage. WC separate from the bathroom. Master bedroom: 1 140×190 cm bed, bedside table, closet wardrobe and a large shelf. Children’s bedroom: 2 80×190 cm beds, a bedside table, a wardrobe and a large shelf. Exterior: Garden furniture (one table and 4 chairs) and a drying room. The Loggia Bay combines the very large volume of its living room with its pleasant covered gabled terrace. Mobile home equipped with air conditioning. - Kitchen equipped with a large fridge-freezer, 4-burner gas hob, microwave, coffee maker, kettle and all the crockery. - Living room with dining table and large corner seat and 2 chairs. - Parents room with semi-open furniture headboard 140x190cm, reading lights with integrated switch, 1 suspended metal bedside, wardrobe and combistore blackout mosquito net. - The children's room with bridge furniture with sliding door, metal bedside table, wardrobe, 2 single beds 80x190cm and combistore blackout mosquito net. - The bathroom with shower and vanity unit with integrated towel rail and shelf, corner shelf, window with frosted glass for optimal privacy and separate toilet. Beautiful terrace of 7.30 m² covered area with a crawling ceiling. Perfect for protection from the sun or rain. Garden furniture with table and 4 chairs, clothes rack and 2 chairs chiliènne. Covers, pillows and household kit (without product) provided. Fun accommodation between the tent and the mobile home. 1 bedroom with double bed 160x200m. Headboard with dresser equipped with fridge, microwave, coffee maker, kettle and table with 2 stools. Storage 3 shelves with wardrobe. Storage bin on wheels. Equipped with crockery and kitchen kit. Covered terrace with table and 2 chairs, kitchen furniture equipped with 2 gas burners and 2 chiliennes. Blanket and pillows provided. Provide bed linen and house. Ogni anno un ispettore visita il Campeggio Le Val de l'Arre, controllando oltre 200 tra attrezzature e altri punti di interesse del campeggio. L'ispettore è un dipendente ACSI e non lavora per il campeggio. Our second visit to this site. This time we stayed 2 weeks. Lucky to again have a riverside pitch. Very helpful owners who pushed van onto pitch for us (our mover not working)! Love the town and the area. Will be back!! Volete prenotare il campeggio Campeggio Le Val de l'Arre o oppure saperne di più? Potete farlo usando i seguenti dati oppure tramite il sito del campeggio. Su A75 uscita 48 Le Vignan D999. A destra 2,5 km dopo Le Vignan sulla rotatoria. O su A6/A7/A9 uscita Nîmes Ovest. Circonvallazione di Nîmes direz. Alès. Poi D999 e alla rotatoria a sinistra 2,5 km prima di Le Vignan. 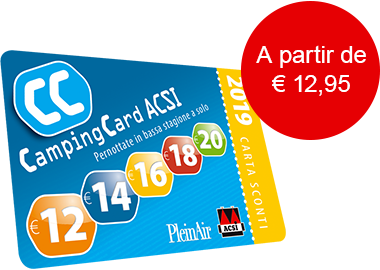 ACSI Eurocampings invia la tua richiesta di informazioni al "Campeggio Le Val de l'Arre".